Aberlour 10 Year Old Single Malt Scotch Whisky is welcoming, vibrant and rewarding malt from highlands of Scotland. Matured in a combination of hand-selected traditional and sherry oak casks for a minimum of ten years, the mellowed spirits within are combined to deliver a balanced flavour. This whisky represents the very essence of Aberlour character. 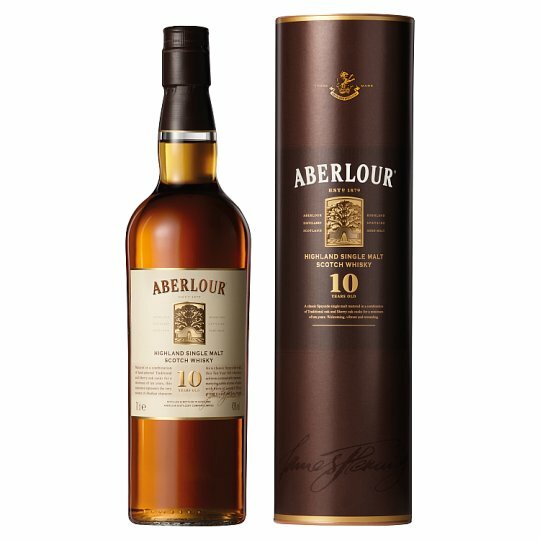 As a classic Speyside malt whisky, Aberlour 10 Year Old achieves a remarkable harmony marrying subtle aromas of spice with hints of autumn fruits, giving it a soft and long finish. Sold in its signature box, it is the perfect gift for any occasion. Serving suggestion: Enjoy straight, neat or on the rocks. At Aberlour we believe in substance over style. Our whisky is born out of craft, passion and knowledge that's been handed down through generations. Our story is of community, locally sourced ingredients and families of craftmen who shaped us into who we are today. Aberlour is generally double-cask matured in Oloroso sherry casks and American oak barrels to create our recognisably rich and complex Speyside single malt whisky. Steeped in centuries of legend and surrounded by the dramatic highland scenery of Ben Rinnes, the village of Aberlour lies at the very heart of Speyside, where the Lour burn joins the River Spey. The exceptionally pure, soft spring water used for making Aberlour whisky is drawn from nearby natural springs. Colour: Gold. Nose: The dry, fresh, fruity aromas of early autumn apples and pears are subtly enhanced with sweet notes of vanilla and mint toffee. Palate: Exceptionally smooth and creamy, with spicy-sweet nutmeg and honey combining with the freshness of autumn fruits. Finish: Long, soft and warming.